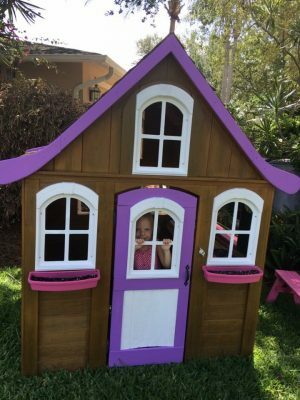 Check out what our neighbors did with another neighbors old playhouse they were giving away. 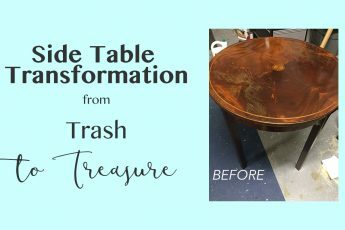 Y’all know I love a good makeover and upcycling story as I’ve done of lot of makoever-ing and upcycling myself. As much as I’d love to be able to throw away all my old furniture and get all new stuff, it isn’t happening at the House house, at least not right now. So since we’ve moved in here I’ve painted and/or updated a lot of our old stuff. Like my dining room table, these old bar stools, some left over wood pallets, and even these wine corks just to name a few. 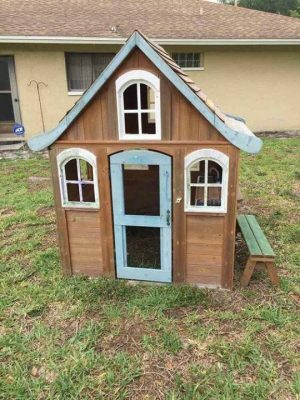 Anyway, I thought I’d show you how my neighbors made over this old playhouse. Yay for makoevers! 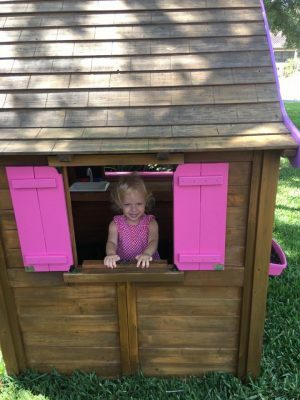 Here is the before picture of the playhouse. Our neighbor’s 2 girls had outgrown it so they passed it off to our neighbors across the street who’s little girl just turned 2. It is the perfect size for her. It was cute before, but definitely had seen better days. The stain was fading from the sides and the blue trim was looking a little dull. This wasn’t a difficult project, just time consuming. After they got it home (they live just 2 houses away from each other) they (mostly Bob, the dad) started working on it. First, he sanded the sides and roof using a hand sander. This took some time. 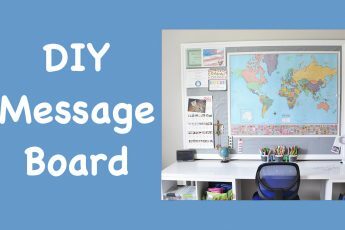 These projects are never ‘quick’, especially when you work full time and have 2 kids at home. Once that was finished, he re-stained the sides and roof to freshen it up. He used a different color stain for both. 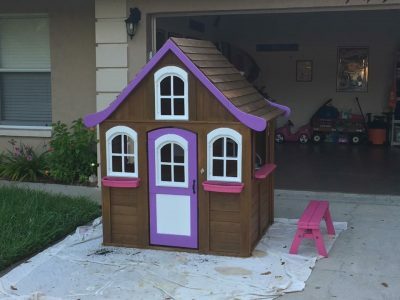 Lastly, he painted the trim and door purple (their daughters favorite color) and the accents pink. He also got creative with the door and used a piece of wainscoting to fill in the bottom half. Overall this was not to difficult and look how stinkin’ cute it came out! I think it’s safe to say their daughter loves it. Look how happy she is in it! And guess what, my boys like it too (and they are 8 and 10), and this little one’s brother (who is 9) and all the neighborhood kids. They’ve been over there playing in it, even though some of them barely fit. 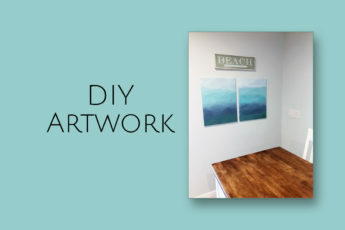 See what you can do with a little elbow grease and some creativity? And it saved them lots of money not having to buy a new house. 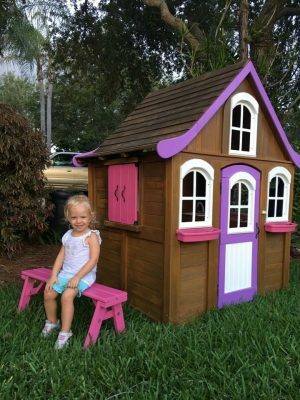 These playhouses are not cheap! Good job neighbors!